Mayim Bialik is a multi-talented professional. Most likely you know her as an actress in the movie Beaches and the TV shows Blossom and currently The Big Bang Theory. What you might not know is that she has a PhD in Neuroscience from UCLA, is an author of two books on Attachment Parenting and a blogger. 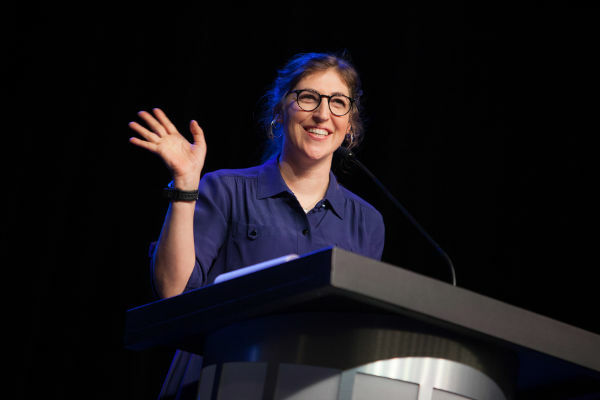 When the conference BlogHer 2016 came to my attention, I was ordering a ticket as soon as I saw Mayim Bialik was a featured speaker. I’m not a much of a celebrity watcher, but this is a woman I pay attention to. You might think my attraction is because she’s a neuroscientist and the brainy character, Amy Farrah Fowler, on The Big Bang Theory. Actually, in both of those roles, she’s an important role model for young women in the sciences. You might think, I’m drawn to the controversial topic of attachment parenting. As a single mother raising two sons, she brings an awareness to the challenging ideas of raising children to thrive in a world quite different than their parents and grandparents. Or, I’m attracted because she’s a fellow blogger. After all, this is a blogging conference for women bloggers. Mayim is not a celebrity blogger because in all humility she does not see herself as a celebrity. She’s a woman of deep faith and intelligence. She wants to know more, to explore, to ask questions and engage through blogging. She was no different from us – having to find a platform, honing one’s writing skills, and then venturing out into a larger audience. That larger audience will now find her at GrokNation. As a blogger, you can appreciate the agony of finding the perfect title for your blog. It’s a refreshing open space to dialog about the questions of the Universe and how we grapple and understand our being part of it. She is not a woman of one thing but a woman of more than one thing. She reminds us, in any of the roles that you relate to her, that we are also women who are more than one thing. We can be different things at different times of our lives and somethings at the same time. And, the best part is that we get to blog about it. Hope you enjoy the video interview below and share your feelings and comments about being more than one kind of woman. Wow – I had no idea! I don’t watch much television, but hats off to this young lady for getting it right – we are not sing’e-dimensional creatures! I always like to get the word out that there are women like Mayim who are challenging the stereotypes about women. Glad you enjoyed. New Groknation fan here – thanks so much for helping me find this space! Hey, thanks for being a fan. I love Big Bang theory since the first episole. Mayim Bialik is very unique. Each of us, like her, is different role at different time of our life – college student, professional, parent, grandparent, stay at home mom, blogger, etc. Each of our journey is different and should be at least blogged or wrote them in the book so that they will inspire others to journey in life. Totally agree, Stella. Glad you enjoyed the post, Stella. I love Mayim Bialik, and how she quietly and powerfully takes her stand for being an amazing grounded observant woman. In Hollywood! How lovely you got to experience her live in person. Sue, the minute I saw she was a featured speaker I was making plane reservations. It’s curious how we view public figures and then how we connect to them on a different level when we get to see them in person. It’s nice to know how well she has navigated the Hollywood scene to remain her own person. Right, you are Kimberly, a wonderful role model. I’ve always admired her. She marches to her own beat, and that’s what makes her wonderful. I’m so glad you enjoyed seeing her at BlogHer. It’s nice to see women coming together to create. It’s funny how when we were kids, the last thing we wanted to do was march to our own beat. Now, as adults doing that is so important in discovering who we are and learning that’s okay to be different. I happy to share this experience with everyone, Joan. Considered a great opportunity to hang out at BlogHer. Learned a lot about the power of women bloggers, especially from Mayim. I’m aware of the show but since I don’t watch TV can’t say that I’m all that familiar with Mayim, but this is a very enjoyable interview and I can certainly understand why she is such an important role model. Marquita, you may want to catch some of The Big Bank Theory clips on YouTube. Mayim has a number of personal interviews there as well. It makes for an interesting observation of the character role and the real person behind it. WHO KNEW! I didn’t know of her other shows, but just knew her from Blossom. I do know she was in BBT, never watched it and didn’t remember she was in Beaches… nor.. a freaken neurochick.. holy cow.. go her… great stuff, for sure! I’m happy to enlighten you, Kristen. As you do the same for me. Yes I know her from Beaches- which I love and thanks for introducing us to her wonderful talents . I’ve always found Mayim Bialak a very multi-dimensional person as well, Joyce. Maybe even farther back than the “Big Bang Theory” though, as I remember her from “Blossom” days. I had no idea she was a neuroscientist, nor that she was an expert in attachment parenting. Thanks for sharing her by saying, “She is not a woman of one thing but a woman of more than one thing.” This is something I’ve strived for since I was young, although sometimes this idea of doing many things, is seen as being a generalist. There are so many facets to each of us, that we do ourselves a disservice when we don’t explore all the things that interest us. How exciting to have her as a guest speaker at BlogHer. I will also check out her blog. Thanks so much for sharing! Beverley, I think there are people who focus on the one thing they do well in their life and are content with that. Then, there are others who are curious and want to try new and different things. What I find fascinating about her is her willingness to explore and go in new directions, while remained grounded and secure in who she is and what she is capable of. Yes, I will be following her blog as well. I know her (vaguely) from the Big Bang Theory; I don’t have a TV or have seen more than a few episodes. But the other parts of her life…wow. How wonderfully complex she is — as w all are. I’m sure you’ve heard plenty of incredible stories from and about the most apparently “normal” people. We all have our stories, and they are all amazing. All we have to do is stop, ask and listen. You’re absolutely right, Jackie. We all have our stories and some are crazier than others. It’s important to be an active listener because so many want and need to be heard. You can check her out on YouTube – both for season 4 going forward on The Big Bang Theory and her own personal interviews. Fun watching when you need a break. I knew about Mayim’s degree and acting roles but had no idea about her other accomplishments. She’s living proof that life isn’t about how many hours we have in a day but how we use them. Her next book should be on time management and productivity–haha! She doesn’t seem to care too much about Hollywood and her celebrity status, which I like about her. Quite inspirational! Meghan, thanks for commenting. Agree, she must have great attention and focus to be able to accomplish so much. How exciting to have her at the BlogHer conference. It says a lot about the organizers who selected her and the goals for the conference. I’ve always known women are more than one thing. There is some statement that gets bandied about that men could not be wives, moms and wage earners, certainly not as effectively as women. Staying at home didn’t suit me after I had my second child and I returned to my field as a career counselor. I enjoyed juggling career, parenting, being a good wife who knew how to cook and entertain. And very active in a few local communities. In my day what I did day to day was not common and I knew I could be many things. I even got my MA along the way. We need role models like Mayim and these types of conversations. Looking forward to more blogs about the conference. I think women who make the best choices for themselves are happier. Today they have more opportunities with less guilt directed at them for working outside the home or deciding to stay home. As a society, I believe we are better for having women play a greater role in the public discourse. Oh, do I love stories about strong, brilliant, inquisitive women, Joyce! I especially love your description of her: “She is not a woman of one thing but a woman of more than one thing.” How empowering that is! So happy you love this post about Mayim. I”ve been a fan of her since she appeared on Big Bang, and it’s fun to watch her now after seeing her in person. We need all kinds of empowering female figures that aren’t cookie cutter types. She’s definitely unique, but one that we all can relate to. I loved learning about Mayim. I loved her in Beaches. That still is probably my all time favorite movie. I didn’t know she became a neuroscientist. Very cool. I will be checking out her blog. Karen, I think they are planning to remake Beaches, but nothing will take the place of the original. Yes, she’s definitely one to keep track of. What an amazing woman and a great role model for us all. Love that she is so humble and doesn’t consider herself a celebrity. Yes, I believe her humility is what makes her so endearing to us. I love her. She also represents to me that we can be whatever we want if we just apply ourselves. Thanks for sharing her other interests. I didn’t know about them. Glad you love her too, Sabrina. She certainly shows us what’s possible.